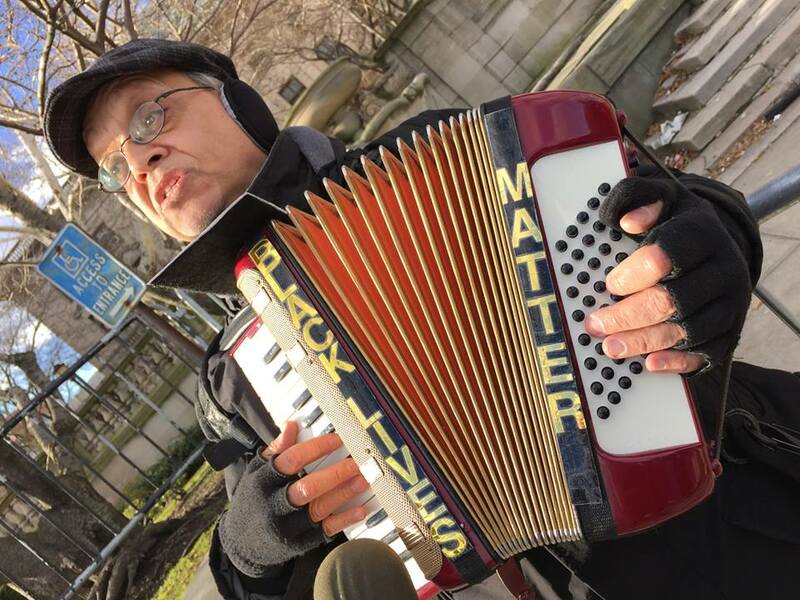 Paul Stein – Music for Social Change | Paul Stein uses his accordion, melodica, claviola, voice, & original songs to support peace, justice, & the environment. Co-founder of The Occuponics, who were active throughout Occupy Wall Street, he can be heard at marches, demonstrations, rallies, & vigils all around the New York City area, often with the Filthy Rotten System band. 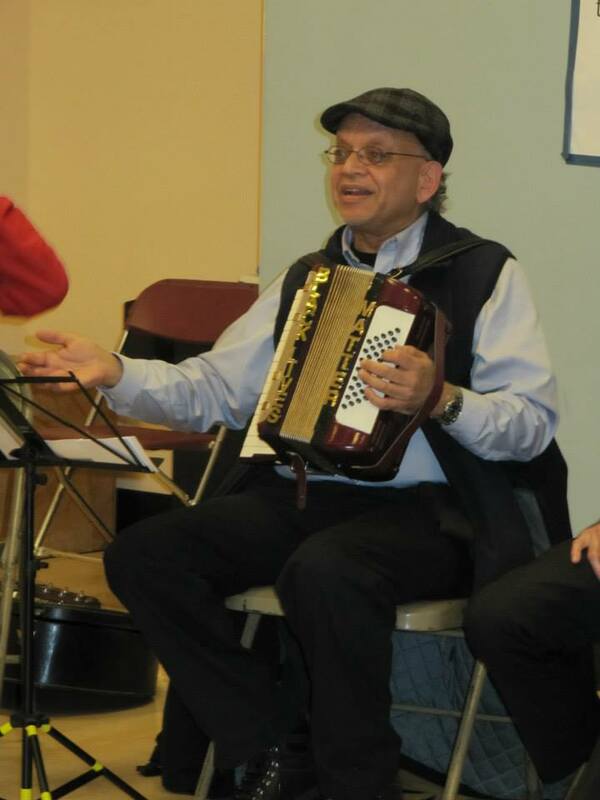 Paul Stein uses his accordion, melodica, claviola, voice, & original songs to support peace, justice, & the environment. Co-founder of The Occuponics, who were active throughout Occupy Wall Street, he can be heard at marches, demonstrations, rallies, & vigils all around the New York City area, often with the Filthy Rotten System band. 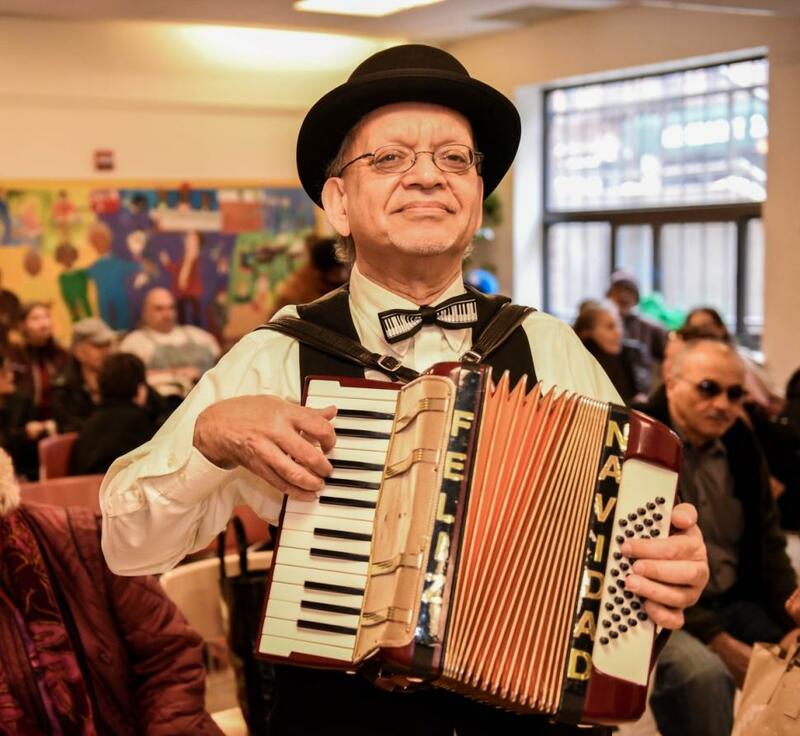 On the morning of April 11th, at a spirited interfaith seder/rally in support of immigrant advocate Ravi Ragbir and millions of other immigrants who are at risk of detention and deportation. 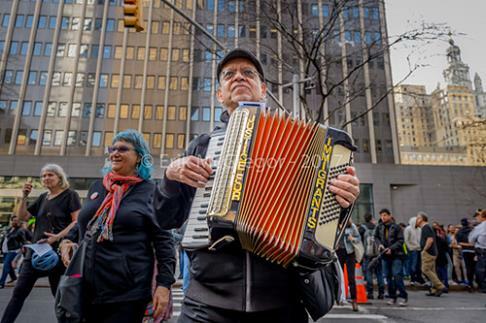 My accordion led the march with music from outside local ICE headquarters in Manhattan at 26 Federal Plaza to New York Law School, whose immigration clinic staff faculty and students have been defending Ravi with great skill and dedication. At the close of the seder, over 100 immigration activists movingly sang “Let My People Stay”. The Walkabout Clearwater Chorus and Reverend Billy and the Stop Shopping Choir also lifted people’s spirits with song. 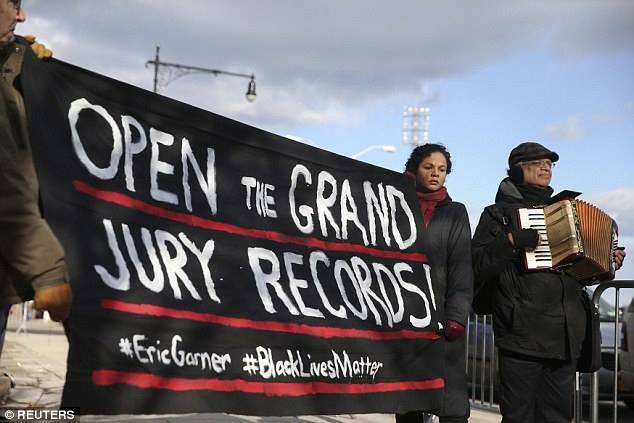 Thanks to photojournalist Erik McGregor for capturing the march. Printed below is the final published version of “Let My People Stay!”. It includes small changes and improvements over the version that was sung on April 11th. Immigrants helped build this land. Welcome all with love each day! We take a stand throughout the land. See our faces proud and strong. All faiths and colors, we belong. ICE, set our friends and families free! Give me your tired, give me your poor. Refugees flock to our shore. Hate threatens peace and liberty. May be used for noncommercial purposes. March to Senator Schumer’s office from the rally outside the Sheraton New York to stop implementation of the Trans Pacific Partnership (TPP). 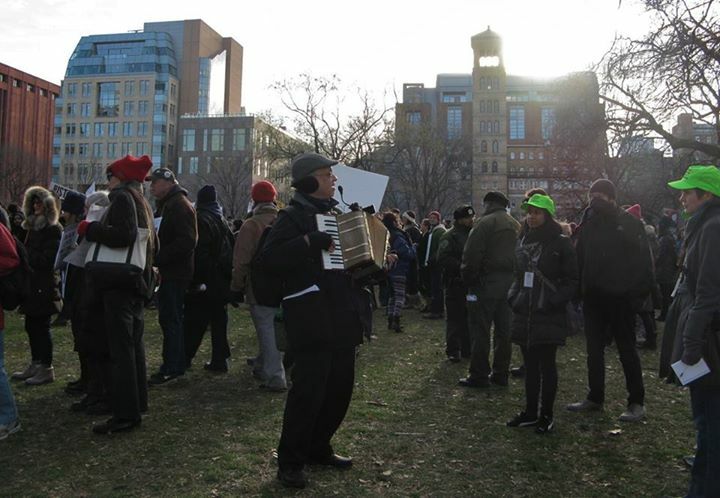 My accordion provided musical accompaniment for the march, as well as for the Raging Grannies at the Sheraton rally. 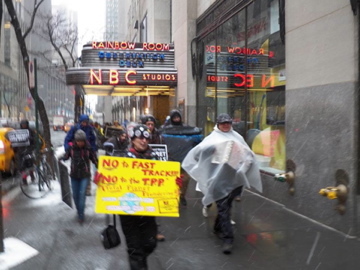 About 130 folks rallied in the cold and snow. 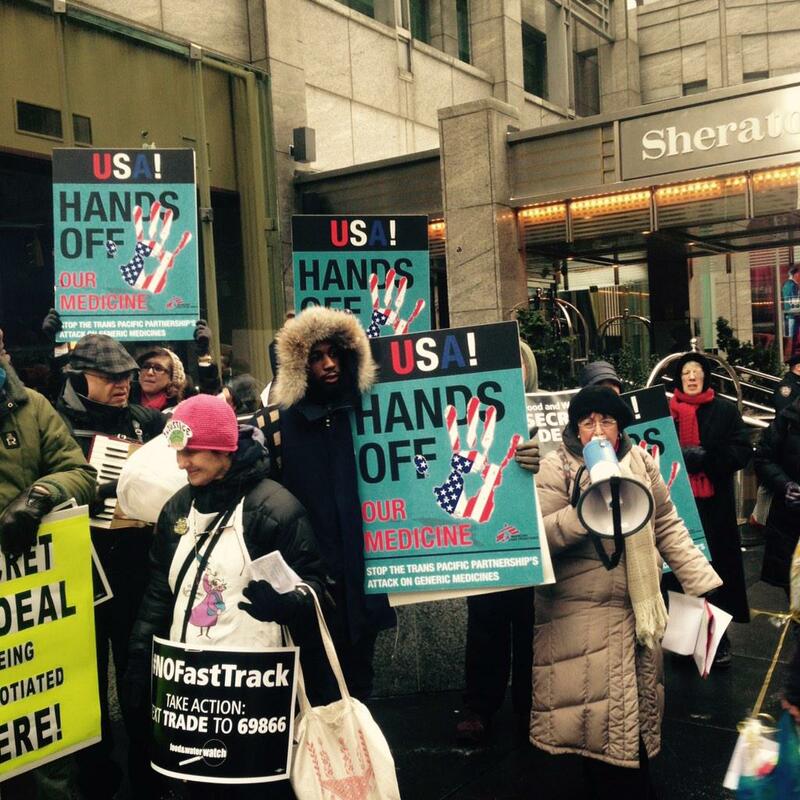 I led the singing of “We Shall Not Be Moved” at the Sheraton and “We’re Gonna Stop the TPP” (to the tune of “We’re Gonna Roll the Union On”) outside Senator Schumer’s office building for a couple of dozen intrepid protestors who made the march. My accordion was well-protected from the snow by the rain poncho. Thanks to Owsspag Apollo for the photo. Thanks for this photo to Jason Cone of Doctors Without Borders/Médecins Sans Frontières (MSF). My annual appearance. It has been one of my favorite gigs since I first appeared there in the mid 1980’s. About five hundred children enjoyed hot dogs and candy, face painting, painting, music, an appearance by Santa Claus, and gifts for all. Thanks to The Legal Aid Society for the photo (just published yesterday on The Legal Aid Society web site). Thanks to Sylvia Martinez for capturing the moment. http://www.nydailynews.com/new-york/pope-francis-calls-peace-christmas-day-speech-article-1.2056832 I had a wonderful time on Christmas Day entertaining diners waiting to be seated or to take out meals at the Goddard Riverside Community Center holiday dinner in Manhattan. Thanks to David Wexler and the New York Daily News for the photo featured in an article describing the dinner. Please scroll down the article for the text and picture. Late Sunday afternoon following the Make Music New York Parranda con Paranda music jam organized by the Bronx Music Heritage Center, WHEDco (The Women’s Housing and Economic Development Corporation), the Garifuna Coalition, and City Lore. 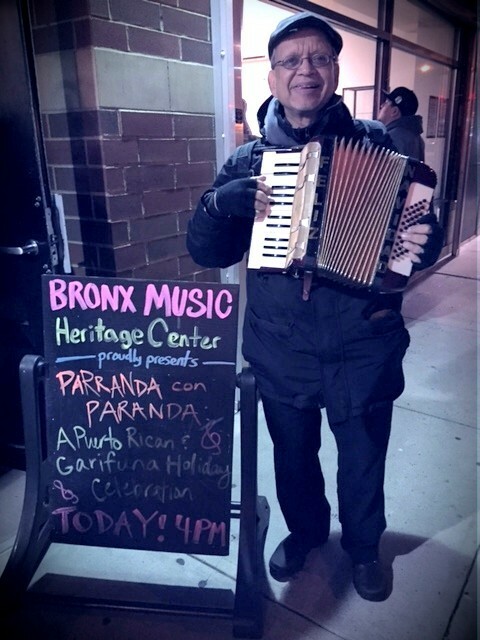 I was present for only part of it, but had fun, and made a tiny contribution (with my “FELIZ NAVIDAD” decorated accordion) to the jam session featuring some great Latino musicians. Thanks to Ariana Hellerman for the photo and for her role in organizing the event. 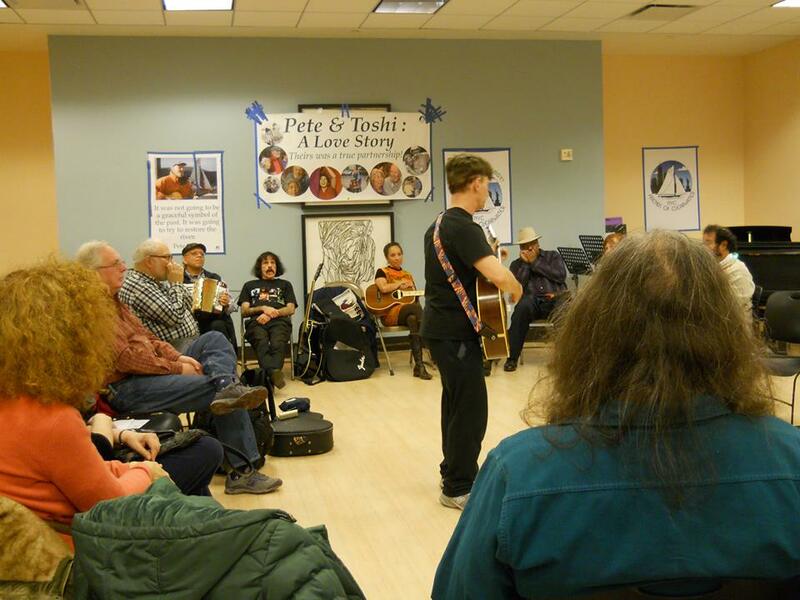 Friday in Manhattan at the NYC Friends of Clearwater holiday party and celebration of fracking ban in New York, with a great group of activists and activist musicians. I played and sang my “Bah Humbug Polka” and “Chokehold” as part of a musical round robin. 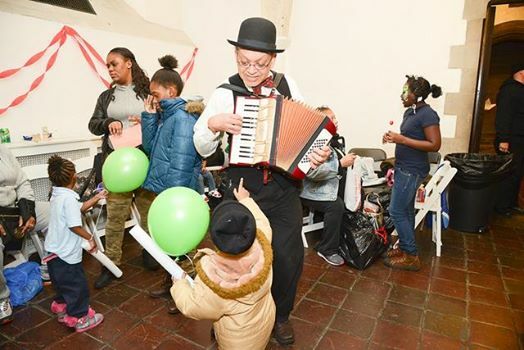 While folks were cleaning up the room, I played a selection of Christmas and Chanukah songs with a smattering of fun dances (e.g., polka, tango, hokey pokey). Thanks to Joel Landy for capturing the moment. 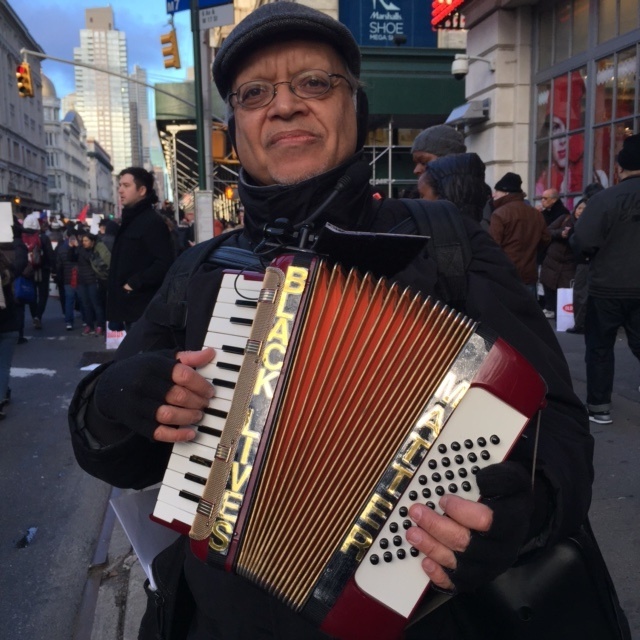 December 13, 2014, One Accordion (but not the only one) at the Millions March NYC – Black Lives Matter! Thanks to Ariana Hellerman for capturing the moment. Click here to find out when and where Paul will be playing next. May 24, 2014 – Accordion Disco Street Theatre Video with a Progressive Orientation – At the March Against Monsanto NYC Rally in Union Square. Providing musical support for the very spirited Bradley Manning Contingent of the NYC Pride Parade.